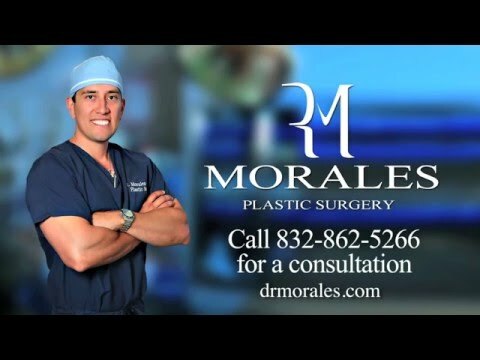 Dr. Morales works with men in the Katy and Houston areas who have excess, sagging tissue in their chest, or have a breast appearance similar to a woman’s breasts. Known as gynecomastia, this condition accounts for about 65 percent of male breast disorders and can be corrected with male breast reduction surgery. This is a procedure used to reduce the size of the breast, and give men a flatter chest with a more masculine male contour. A male breast reduction can significantly improve the self-esteem, confidence and quality of life for a man and allow him to expose his chest without fear or worry. Male breast reduction takes about 2 to 3 hours to complete, and is performed under general anesthesia as an outpatient procedure. The incision is often placed along the edge of the areola, the fold under the breast or in the axilla. Excess breast tissue or fat can be removed with liposuction, excision, or a combination of the two. A few days after surgery, any bandages that are applied are removed. Patients are required to wear a support garment or compression bandage to help support the chest. The chest area will feel tight due to swelling, but fades within a few weeks. The scars will be pink for several weeks, but will fade over several months. Patients will be able to go about light daily activities after the first few days, but more aerobic recreation should be delayed for about 3 weeks. Most patients return to their jobs within 1 week unless their job requires lifting or aerobic activity. The average cost of male breast reduction varies based on the extent of the surgery. Patients can expect to pay around $6,000-7,500 for this procedure. Yes, some insurance policies cover this procedure. It is becoming more common that the patient be aware that approval for the procedure may need documentation or evidence of symptoms, which requires but not limited to a physical exam, documentation from primary care physician supporting the diagnosis of gynecomastia and breast reduction. Denial of the claim is not uncommon as medical reform continues to evolve. Persistence and open discussion with the insurance carrier is necessary. Breast reduction is often combined with liposuction. However, this is will be considered cosmetic in nature, and will not covered by insurance policies, which means the patient will be responsible for the costs of the additional procedure. Every person recovers differently. The recovery period depends on how many procedures were performed at the same time. The average return to work for the standard male breast reduction is 1 week. The average return to routine exercises is no sooner than 2 months.